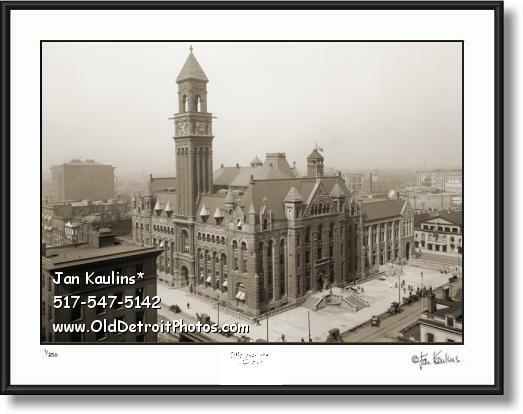 OLD POST OFFICE FEDERAL BUILDING DETROIT photo print picture for sale. This is a sepia toned black and white OLD DETROIT POST OFFICE FEDERAL BUILDING photo print picture for sale made from the restored original vintage (circa 1910) old negative/photo. You can see the streets below filled with Model T-'s. This majestic, castle-like old old Detroit Post Office and US Courthouse was built in 1891-97 at Fort and Shelby streets. It was razed and replaced with what is now the Theodore Levin US Courthouse in 1932. It was one of the most majestic structures in the City of Detroit.